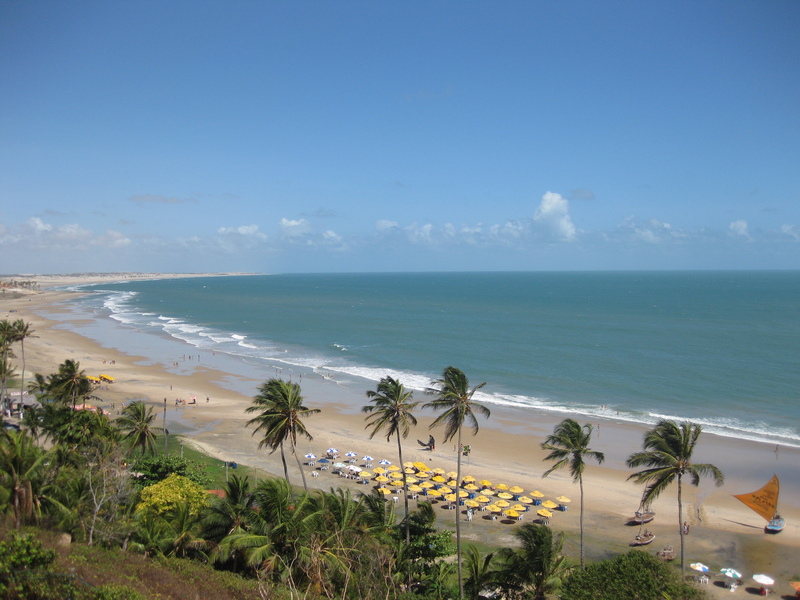 When planning a trip to Ceará you are most probably considering such well-known destinations as Jeriacoacoara, Cumbuco or Canoa Quebrada. However this sunny and windy state has many other secret places to explore, such as Guajirú and Flecheiras. These real hideaways are synonyms of tranquility and comfort. They are beachside destinations where you will not find crowds of mass tourism and other symbols of stressful life. Guajirú and Flecheiras are real hiddean pearls fo Ceará! 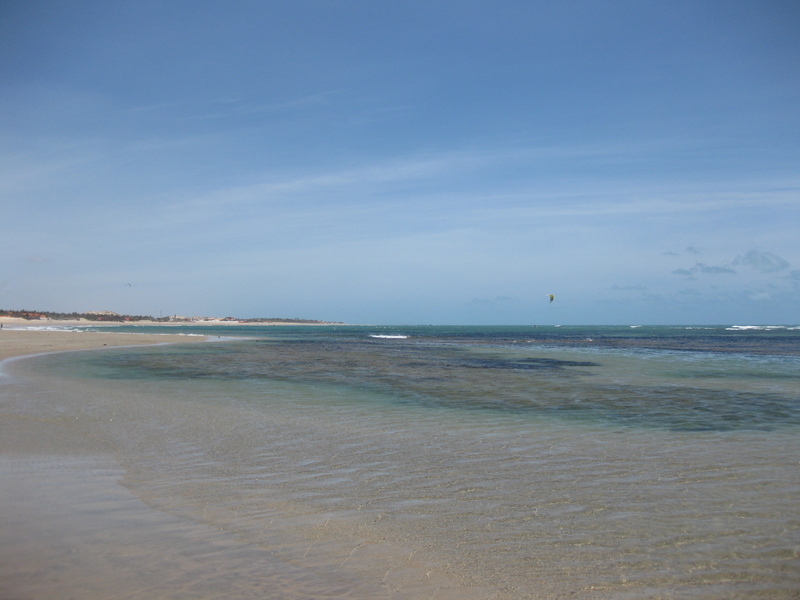 Flecheiras and Guajirú are two tiny beach side villages located one next to another, roughly about 150 km north of Fortaleza. The access is quite easy as the road is in good conditions and as long as you follow the sign of Traíri (the principal municipality) you won’t get lost. On your way make sure you stop in the small town of Lagoinha, just to admire the spectacular views over the beach and take some incredible photos in your album. If you are not in a hurry enjoy a refreshing bath in the sea before you continue yor journey. In case you are not interested in renting a car contract a private transfer taking you directly from the airport to your final destination. Well, let’s get into the point. Why Flecheiras and Guajirú? These two villages are located behind immense dunes, have an endless white sand beach and enjoy such a peaceful tranquility, something that will guarantee your rest. During the heat of the day the streets of the village are basically empty, many of the stores are closed and only few tourists enjoy the rays of sun light. When the night falls the things doesn’t change too much. The stores open their doors, but the rhythm of life remains as peaceful as during the entire day. It’s simply impossible to get stressed here. Out of these two Flecheiras is slightly bigger than Guajirú, but just slightly, as the two of them are pretty small fishermen villages anyway. In Flecheiras you will find few beach side restaurants servings meals and drinks, while in Guajirú this sort of service is offered only by the few hotels located right in front of the sea. 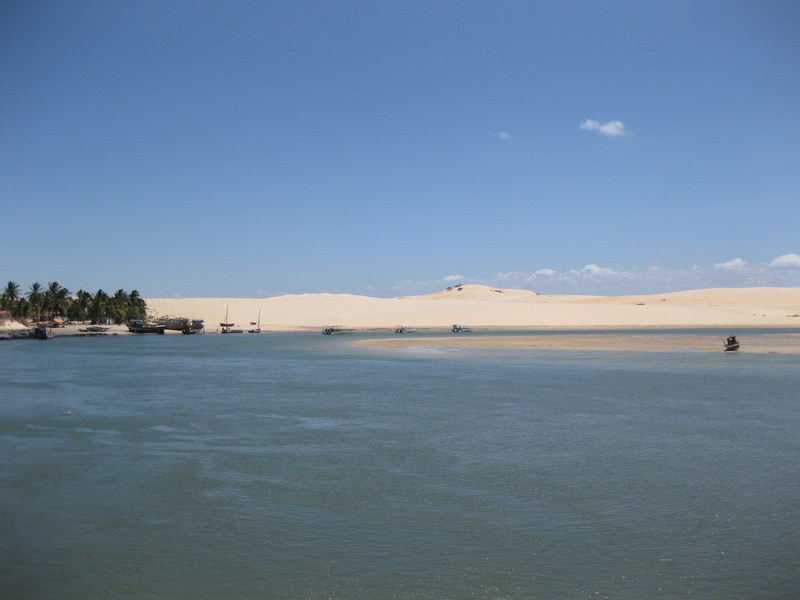 There are not that many activities to do in these two villages, unless you want to take a buggy ride along the beach either to Lagoinha or to Jericoacoara. An alternative option is to visit the nearby city of Mundaú and take a sunset river cruise along the Mundaú river. Even if you won’t take the sunset excursion a quick visit to Mundaú is worth it as the river view together with the dunes and the sparkling sea is simply spectacular. 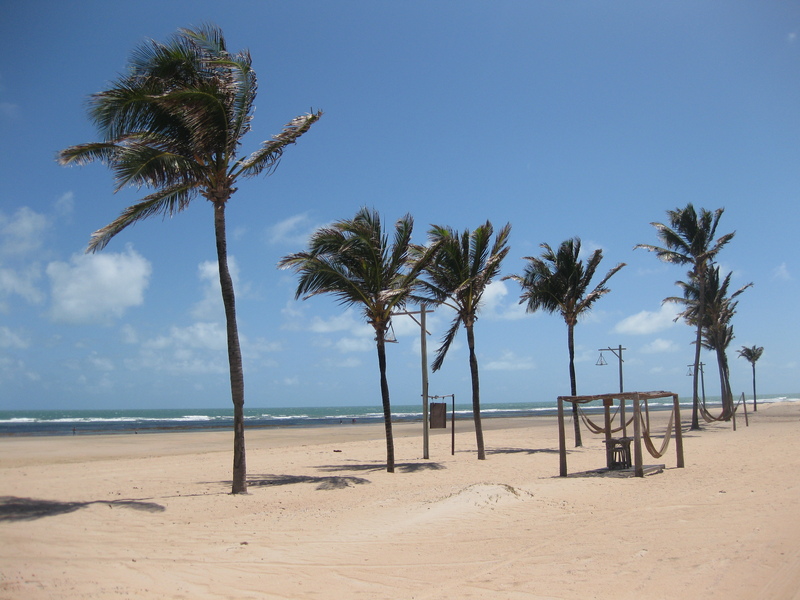 The lovers of kitesurf will find the winds of Ceará excellent for the practise of their favourite sport. Beside of the activity options mentioned above my recommendation is to relax and enjoy, that’s what Flecheiras and Guajirú are made for. Lay down in a hammock and watch the sun setting down slowly. For a moment it feels like if the time had stopped and all the worries of the world disappered. This blue moment filled with tranquility and harmony is such a heavenly experience, something to be remembered long after your trip to Flecheiras and Guajirú. Pousada do Paiva, Flecheiras – An good tourist class pousada in the heart of Flecheiras. Pousada do Paiva has a lovely garden with many details and spacious rooms with balconies, half of them facing the sea. Art Orixas, Flecheiras – A luxury hotel with art details, very stylish and spacious rooms with private pool and garden or seaview. A real hideaway for lovers! 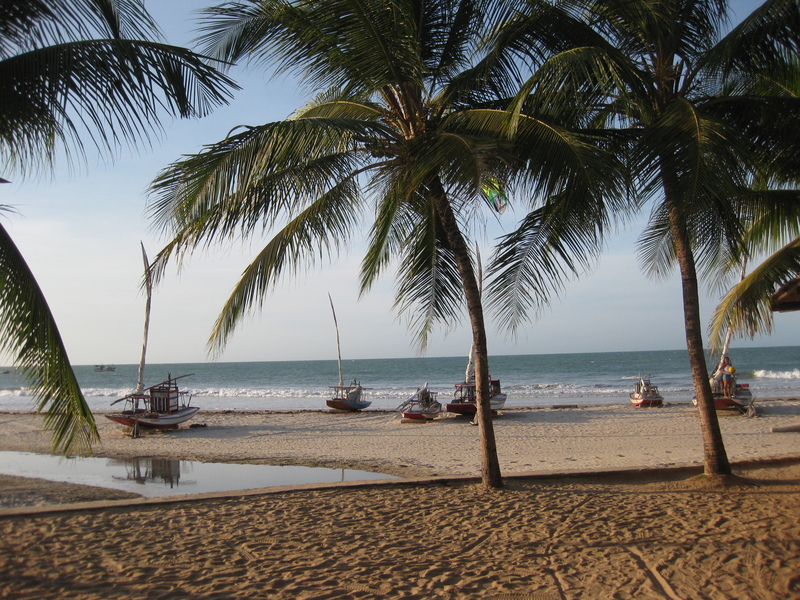 Rede Beach Resort, Guajirú – A quality hotel with rustic details, excellent comfort and direct beach access. Highly recommended! Restaurante Oca do Sabor, Flecheiras – One of the best, if not the best restaurant of the region! Don’t leave Flecheiras without having experienced a tasty dinner in the rustic ambient of Oca do Sabor. 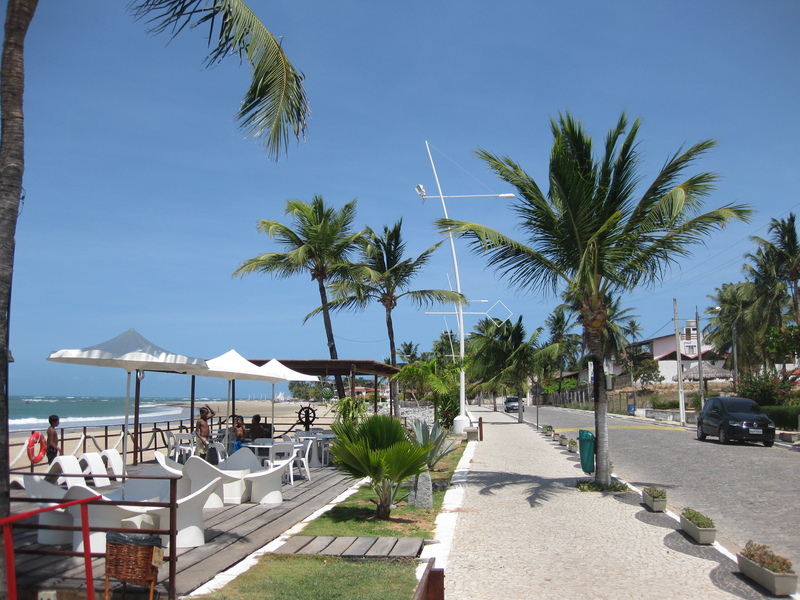 Kalango Lounge Bar, Flecheiras – A place to enjoy a cold drink at the end of the night while listening lounge music and watching torch fires on the beach.